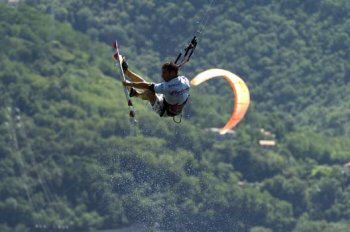 Lake Como was the stunning setting as the Fiat Freestyle team went into action during the first event of the 2006 Kiteboard Pro World Tour, the Italian Fiat Freestyle World Cup last weekend. Wind across Lake Como wasn't favourable to start with but after an early skippers meeting, the race director decided to continue the Freestyle bracket thanks to improving wind conditions. This main KPWT discipline had been previously stopped because of the too strong and dangerous North wind. In the men's discipline, the French competitors proved to be in good shape on the big Italian stage with a final heat being contested between Vincent Tiger and Florian Daubos, a first KPWT podium visit for both. These two excellent riders are now the standard setters for the 2006. This first round also revealed two new kiteboarding stars: Sander Lenten, kicked out in the quarter-finals by the event winner Vincent Tiger and Florian Daubos, the winner of his confrontation with the KPWT 2005 World Champion, Thomas Cocquelet. On the women side, the KPWT 2005 final ranking was respected and all leaders confirmed their supremacy at this sport it this first round. Gisela Pulido defeated her compatriot Noelia Nunez and the Turkish rider Julie Simsar also won against New Caledonian Perrine Scelland in the loser's final heat. A good performance was turned in by the local rider Andrea Olah, as well as the Portuguese Margarida Ribeiro, and the Australian Marine Sudre. The next event in the Jim Beam Kiteboard World Cup will take place in a fortnight's time in Turkey. Launched in 1999, the Kiteboard Pro World Tour is the professional World Cup of Kiteboarding that promotes the sport and its star riders on an international level. Forty three events have been held to date in fourteen countries across the five continents. The 2006 series of nine events crowns the men and women world champions, for Senior and Junior divisions, Wave and Freestyle. In the men's discipline, the French competitors proved to be in good shape on the big Italian stage with a final heat being contested between Vincent Tiger and Florian Daubos, a first KPWT podium visit for both. 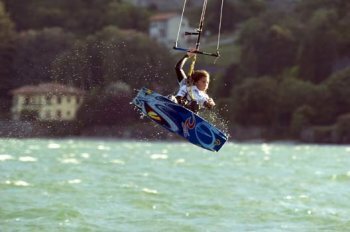 Lake Como was the stunning setting as the Fiat Freestyle team went into action during the first event of the 2006 Kiteboard Pro World Tour, the Italian Fiat Freestyle World Cup last weekend. The international circuit first became reality in 1999, with two main stages in the Cabo Verde Islands and Dunkerque in France. 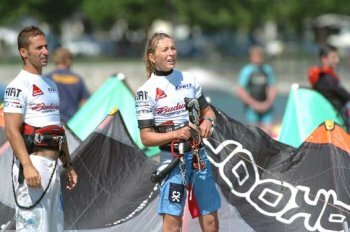 In 2000, the Kiteboard Pro World Tour expanded to encompass the World Cup in Waves and Freestyle over seven stages in the Cabo Verde Islands (Sal Island), the Dominican Republic (Playa Cabarete), Morocco (Essaouira), France (Palavas and Dunkerque), Great Britain (Cornwall) and with the final held in Brazil (Rio de Janeiro). 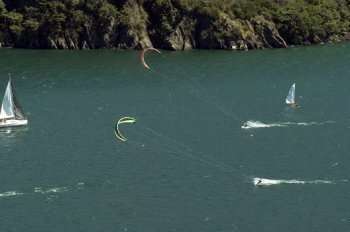 Challenges in long distance and obstacles (Kiteboardcross) were also held in Naussac, France, but did not count towards the Tour results. In 2001 another seven international stages of the Kiteboard Pro World Tour took place on the Cabo Verde Islands, Sardinia, Greece, Great Britain, New Caledonia and Brazil. In addition, the Tour gained recognition and confirmed its reputation thanks to the support of the French Free Flight Federation (FFV) In 2002 five events in Belgium, Turkey, France, New Caledonia and Brazil followed. The next year four events were held in France, Turkey, South Africa and New Caledonia. Aside the KPWT freestyle world cup circuit, Frédéric Gravoille and Christopher Tasti launched a new concept: the Wave Masters, competitions of wave riding. The first Wave Masters season was composed of two events in Cabo Verde and South Africa, where the top pro international wave riders gathered. The KPWT went on in 2004 with four events in France, Turkey, Portugal and New Caledonia. Besides, a Wave Masters session took place in Portugal. In 2005, there were six events with new destinations, Perth in Australia, Cabo Frio in Brazil, Como Lake in Italy; St Gilles Croix de Vie in France as well as events in Turkey and New Caledonia.